Prompt action from Nia Griffith MP and Cross Hands residents, who had heard that the Community Council had been talking about selling off the Memorial Gardens on Llandeilo Road and moving the Cenotaph, has resulted in councillors hastily reassuring residents that nothing had been decided. Cross Hands councillor Ryan Thomas alerted local residents and MP Nia Griffith to his concerns about what the council had been discussing, and following a well-attended meeting at the Cross Hands Club on Tuesday evening, the residents elected a representative, Bob Gunstone of Maesyrhaf, to ask for permission to speak on their behalf at the monthly meeting of Llannon Community Council in Tumble hall on Wednesday evening. 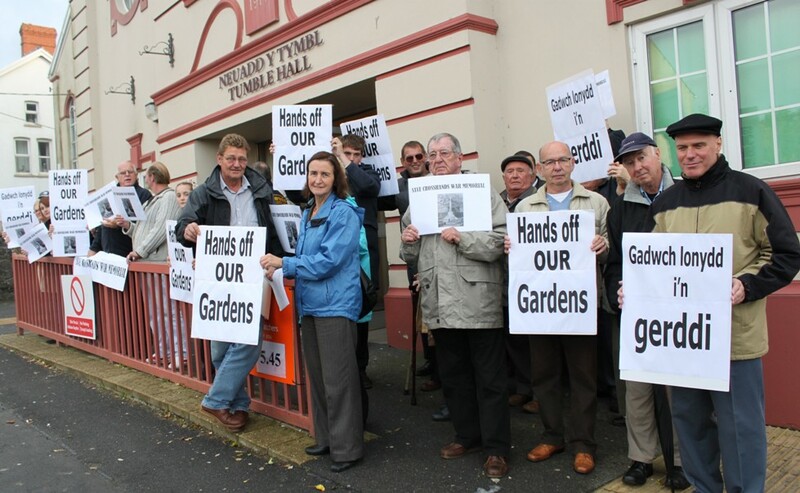 To make sure that the Community Councillors realised just how much concern their discussions about the Memorial Gardens, the residents waved placards outside the Council meeting, handed letters to the Councillors and, as many as could fit, squeezed into the Committee room where the councillors were holding their meeting. They had also collected a petition of over 200 signatures from local residents, just in one afternoon.